Bread knife with plastic handle whose blade is like the Swiss mountains in the Bernese Oberland. Because of its sharpness it is also very suitable for cutting meat and other foods. The PanoramaKnife is made from stainless cutlery steel 42 (Molybdenum/ Vanadium), DIN No 1.4116. hardened to 54-55 HRC (Hardness Rockwell C). The blade has been blue-polished, the handle consists of polypropylene. The riveting is aluminium. In addition to a useful and high-quality kitchen product, the PanoramaKnife has become a popular gift and souvenir. 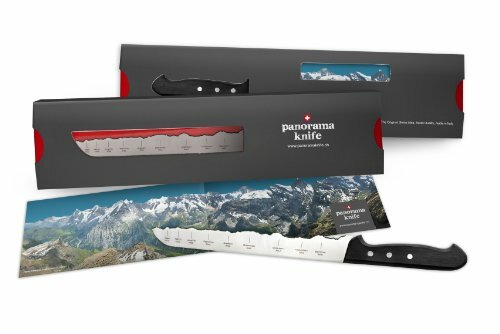 The PanoramaKnife brings a bit of home to Swiss people abroad, a beautiful memory to Switzerland lovers and world travelers into their everyday lifes. If you have any questions about this product by PanoramaKnife, contact us by completing and submitting the form below. If you are looking for a specif part number, please include it with your message.